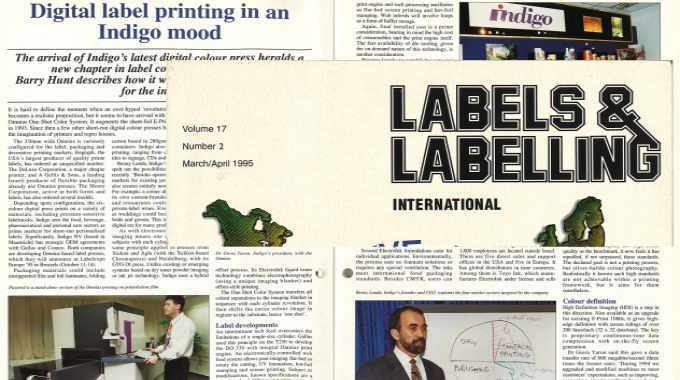 In this article from 1995*, Barry Hunt looked at Indigo’s latest digital colour** press, how it heralded a new chapter in label converting technology and likely implications for the industry. It is hard to define the moment when an over-hyped ‘revolutionary’ technology becomes a realistic proposition, but it seems to have arrived with Indigo’s web-fed Omnius One-Shot Colour System. It augments the sheet-fed E-Print 1000 launched in 1993. Since then a few other short-run digital colour presses have also captured the imagination of printers and repro houses. The 330mm wide Omnius is variously configured for the label, packaging and decorative printing markets. Engraph, the USA’s largest producer of quality prime labels, has ordered an unspecified number. 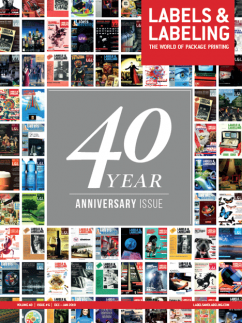 The DeLuxe Corporation, a major cheque printer, and A Gellis & Sons, a leading Israeli producer of flexible packaging already use Omnius presses. The Moore Corporation, active in both forms and labels, has also ordered several models. Depending upon configuration, the six-colour digital press prints on a variety of materials, including pressure-sensitive labelstocks. Indigo sees the food, beverage, pharmaceutical and personal care sectors as prime markets for short-run personalised labels. Significantly, Indigo NV (based in Maastricht) has strategic OEM agreements with Gallus and Comco. Both companies are developing Omnius-based label presses, which they will announce at Labelexpo Europe ‘95 in Brussels (October 11-14). Packaging materials could include unsupported film and foil laminates, folding carton board to 280gsm, metal or plastic containers. Indigo also targets decorative printing, ranging from customised ceramic tiles to signage, CDs and toys. As with electronic printing, digital imaging means one or more variable subjects with each cylinder revolution. The same principle applies to presses from Xeikon and Agfa (with the Xeikon-based Chromapress) and Heidelberg, with its GTO-DI press. Unlike existing or emerging systems based on dry toner powder imaging or ink jet technology, Indigo uses a hybrid offset process. Its ElectroInk liquid toner technology combines electrophotography (using a unique imaging blanket) and offset-style printing. The One-Shot Colour System transfers all colour separations to the imaging blanket in sequence with each cylinder revolution. It then shifts the entire colour image in register to the substrate, hence ‘one shot’. An intermittent web feed overcomes the limitations of a single-size cylinder. Gallus used this principle on the T250 to develop the DO 330 with integral Omnius print engine. An electronically-controlled web feed system allows post-imaging flat-bed or rotary die cutting, UV lamination, hot-foil stamping and screen printing. Subject to modifications, known specifications are a print length of 437mm and print width of 308mm. Print speeds depend on colours, ranging from 4,000 impressions/hour single colour to 666 iph for six-colours. 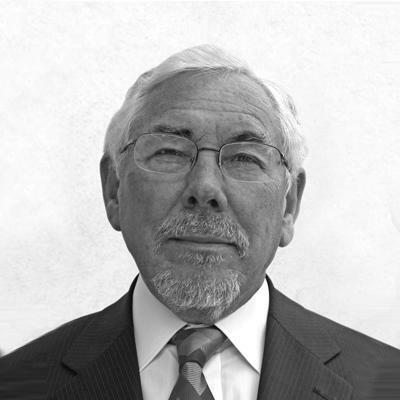 Comco’s Indigo version is expected around the end of 1995, says Rolf Reichley at Comco Europe. Once again an electronic web transport provides the link between the print engine and such processing ancillaries as flat-bed screen printing and hot-foil stamping. Web infeeds will involve loops as a form of buffer storage. Again, final installed cost is a prime consideration, bearing in mind the high cost of consumables and the print engine itself. 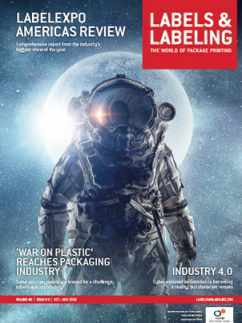 The fast availability of die tooling, given the on-demand nature of this technology, is another consideration. Pricing levels to establish costs per impression remain a closed book. Indigo does not comment publicly on pricing, despite obvious interests here. Rather, it states it is not in a cost-driven industry, but instead emphasises the value added element. The company will announce list prices to potential users of Omnius and E-Print 1000 upgrades at Drupa ‘95, where it will display a dozen machines. ‘Based on US experience, most customers go for leasing plans, with typical monthly payments of $10,000. Hardware is therefore a secondary issue. With consumable costs, users need to identify added-value markets to justify end-user prices. In other words, converting customers from a manufacturing process to a service-based process,’ says Dr Giora Yaron, Indigo’s president. To help customers protect their investments against obsolescence, both systems include modular electronic components to allow simple upgrades. The generic print engine has a long life, but is replaceable. Indigo says it is too early – or perhaps impossible – to establish figures governing economical run lengths, which can be as small as one copy. In label printing for example, the Omnius prints 70,000 labels in the time it takes to make-ready a conventional press. Much shorter runs will apply once the markets understand the power of electronic printing. Several Electrolnk formulations cater for individual applications. Environmentally, the process uses no fountain solutions or requires any special ventilation. The inks meet international food packaging standards. Besides CMYK, users can include silver and gold metallic inks, fluorescent and bespoke colours that remain consistent from job to job. How much interest is there in short-run digital colour? Plenty it seems. Indigo saw gross revenues zoom from $3.2 million for the third quarter of 1993 to $25.7 million for the same period in 1994. Currently it has installed over 180 E-Print 1000s mainly in the USA, Japan and Europe, in trade repro houses, service bureaux and commercial printers. Indigo has 18 years of experience of electronic printing. Its R&D, service, training and manufacturing headquarters are near Tel Aviv, although one third of its 1,000 employees are located outside Israel. There are five direct sales and support offices in the USA and five in Europe. It has global distributors in nine countries. Among them is Toyo Ink, which manufactures Electrolnk under license and sells lndigo products in Japan, the Far East and Australia. Having established a base in commercial electronic printing, the company wants to repeat this strategy for packaging and decorative products. 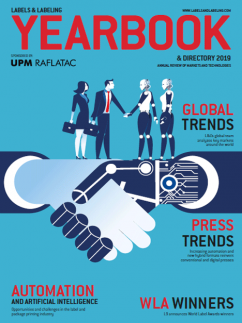 On-demand publishing and office markets will eventually follow, although any office-based products would reflect competitive pricing, rather than high quality colour printing. ‘Following ten years of tremendous improvements [to Electrolnk and associated plotter technology], we launched the E-Print 1000 and surpassed xerographic quality. Now we are on a steep quality curve and expect to remain there for many years to come,’ said Benny Landa. Initially the company saw high offset quality as the benchmark, it now feels it has equalled, if not surpassed, these standards. The declared goal is not a printing process, but silver-halide colour photography. Realistically it knows such high standards are not achievable within a printing framework, but it aims for them nonetheless. High Definition Imaging (HDI) is a step in this direction. Also available as an upgrade for existing E-Print 1000s, it gives high-edge definition with screen rulings of over 200 lines/inch (32 x 32 dots/mm). The key is proprietary continuous-tone data compression with on-the-fly screen generation. A new personalisation feature allowed every ‘page’ to carry several fixed or variable elements, imported and merged from external databases. The system passes layout and job definition through the E-Rip raster image processor for compression as bit-maps for saving to disk and loading to memory. Decompression and on-the-fly imposition follows at the printing stage, giving real-time personalised applications. Layout XTension embraces desktop personalisation. For example, as a Quark XPress extension it allows Apple Macintosh users to define layout and job parameters of personalised or targeted products. Also new is 4-Fi Color. Indigo claims it expands the colour range and enriches colour saturation levels beyond conventional offset colour standards. It is compatible with DuPont’s HyperColor software. Having invested heavily in its own screening technology, the company says users gain no especial merit in using the latest stochastic, or FM, screen technology. Besides Gallus and Comco, Indigo is working with several OEM distributors, specialised materials suppliers and pre-press vendors to market and support E-Print 1000 and Omnius products. The pre-press issue is particularly crucial in successfully integrating any digital printer with a front-end colour system. To obtain seamless interfaces, Indigo has strategic partnerships with Scitex Corporation, Barco Graphics, Dainippon Screen, Linotype-Hell, Crosfield, Dalim and Xyvision (but not yet Purup Prepress). A software utility allows compatible colour calibration against industry standards. Users can access either PostScript or proprietary file management platforms. For example, the Scitex link involves its Impak PS system using either PostScript or Scitex HandShake platforms. Barco Graphics intends to interface a dedicated version of its FastRip, using industry-standard protocols and formats, to the Omnius. This follows a similar PostScript and proprietary file handling deal with Xeikon, in which Barco has a stake. Avery Dennison, 3M and the Moore Corporation will develop and supply suitable labelstocks. Each will offer such materials to Indigo OEMs, distributors and label end-users. Also, the company is cooperating with Cookson Matthey, a major UK manufacturer of ceramic products and a leading printer of decorative ceramic products. The Avery Dennison link allows Omnius users to access a broad range of dedicated Fasson self-adhesive materials for labels and tags. Similarly, 3M has considerable experience in label materials, including anti-counterfeiting and tamper-evident products. The company specifically plans to improve downtimes and utilisation. This will entail greater emphasis on the training element, including setting up a European training school in April this year. The new infrastructure and increased reliability means users no longer have to install two machines, with on-site support, as in the early days of the E-Print 1000. 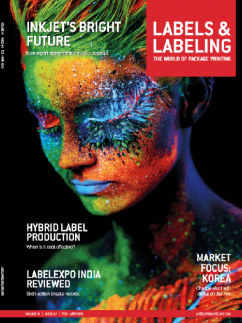 As far as labelling is concerned, any application of digital colour printing must represent a significant step forwards. For the first time it is commercially possible to go from direct input of separated colour files through to automated reel-to-reel production under one roof. Furthermore, the printing process requires a minimum of operator intervention or downtime. It therefore addresses two salient demands: shorter runs with higher quality. But the fact that every printed image could be different adds a third and highly promising element that accords with modern marketing practices. Seemingly, forecasts that label converting technology could differ greatly by the turn of the century assume greater credibility.